The improved Refine Edge feature in Adobe Photoshop Creative Suites 5 lets you preview what your changes look like as you make them. It’s available on the Options bar across the top of the Photoshop window whenever a selection tool is active. 1Make a selection with any selection tool. The Edge Detection section of the Refine Edge dialog box offers you the opportunity to make refinements to the selection edge. 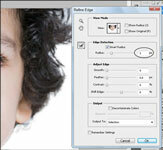 2Click the Refine Edge button on the Options bar at the top of the Photoshop window. 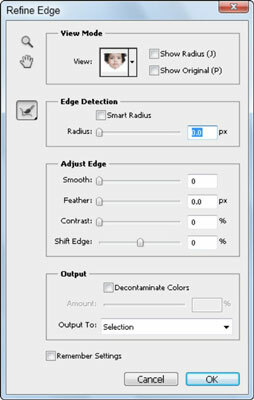 3In the Edge Detection section, select the Smart Radius check box. The Smart Radius feature automatically adjusts the radius for hard and soft edges found in the border region. The hair selection is improved by increasing the radius to a value of 3.0 pixels. 4Increase the radius by dragging the slider to the right. The Radius slider lets you precisely adjust the border area in which edge refinement occurs. Depending on the content, you will increase or decrease the radius. If you’re interested in seeing the radius, select the Show Radius check box in the upper right corner of the Refine Edge dialog box.